Engaging in combat is a minifig's highest goal and greatest joy, for he knows that violence is what pleases the Humans best. If prevented from mayhem for too long, minifigs become despondent and irrational, eventually succumbing to dreaded pacifism. Victims of this affliction may find limited use as slave labor, but they're best put out of their misery quickly as target dummies for the other minifigs' amusement. Regardless of the flavor of violence employed, every attack follows the same three steps. First, the attacker measures the weapon's Range (for ranged weapons) or reach (for melee weapons) to see if the attack can reach the target. If the target is within range, the attacking minifig makes an Action Roll to see if his weapon hits the target accurately. If the attack hits, the attacker rolls the weapon's Damage Roll to see if the Damage defeats the target's Armor. Each of these steps can be affected by a variety of modifiers as the units manuever for best advantage. 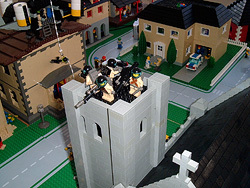 Rappeling in on VTOL transports, military snipers take a commanding view of their zombie-infested town from the top of the church tower. In order to attack a target, a minifig must be able to strike it with a weapon. If the minifig is using a Ranged weapon (a weapon with a Range measured in inches), there must be a clear line of sight between the weapon and the target. The weapon's Range is measured from the business end of the weapon to the target; targets outside of this Range can still be attacked, but with penalties (described further below). Combat involves a lot of die rolls. Players should find excuses to skip them when possible. There are many situations in which an attack is treated as an Automatic Hit, eliminating the need for an Action Roll (although the Action is still spent). A minifig attacking an inanimate object Automatically Hits it, for instance, if he's close enough to touch the object with the business end of his weapon and no one else is attacking him in the meantime. Many types of bodily attacks are also Automatic Hits, including Shoves, Grabs, and bodily Collisions (all described in this chapter), although these can sometimes be Parried or dodged by Bailing out of the way in a panic. Two rolls determine an attack's success, resulting in either a glorious kill or an ignominious lack of effect. Once he's picked a target, the minifig must be skillful or lucky enough to hit it. The minifig spends his Action Die to make an Action Roll against the Use rating of his weapon. If the result of the Action Roll (including modifiers) is equal to or greater than the Use rating, the attack strikes the target. If not, it misses completely, resulting in humiliation for the attacker. He may say "I meant to do that," but everyone knows he's lying. If the attack hits, it then has to do enough Damage to destroy the target. The player rolls the dice in the weapon's Damage rating. If this Damage Roll (including modifiers) is greater than the target's Armor, the target is destroyed (or parts of it are destroyed, in the case of larger targets). Congratulations! If the roll is equal to or less than the target's Armor, however, the attack has glanced away harmlessly, traditionally accompanied by one or more players making a "ka-ping!" sound effect. Destroying a target is rarely a foregone conclusion, and ambitious leaders will want to give their troops every possible advantage. And while the best defense is a gratuitously overpowering offense, it's important to minimize the enemies' advantages at the same time. There are a number of conditions that players can manipulate for Action Modifiers to improve or handicap an attack's chances of success. 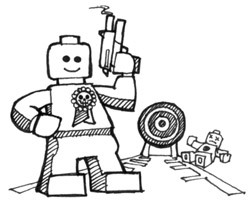 Positive bonuses can add to a minifig's Action Roll, to the Range of his weapon, or to the Damage dealt on a successful hit. Negative penalties can subtract from an attacking unit's Action Roll or Damage total. Action Modifiers can sometimes raise or lower an Action Roll by a large amount, but remember that Critical Successes and Failures mean that the results of a roll are never guaranteed. Critical rolls are based only on the numbers rolled on individual dice, not on the final totals after modifiers are applied (1.2: Numbers). Standard attacks are based on nature's perfect target: the minifig. 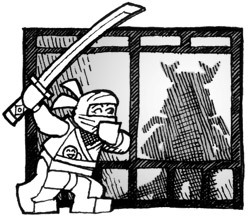 When checking for visibility modifiers, or if you're a ninja practicing swordplay, remember that a minifig is divided into three main parts. After failing in his attempt to blow up some VOL troops standing inadvisably close to explosive gas cannisters, the Immortal M.Q.S. takes cover at the end of this corridor. from "Zombie (Zulu) Dawn Turn 8"
A weapon's standard Use Rating applies when it's used to attack a minifig or similarly-sized target. Larger targets are easier to hit, and smaller targets are more difficult. For targets that are very large, like the ground, the broad sides of barns, and Humans, attackers receive +1 to their Action Roll for every 2" of the target's Size. This bonus only applies to sections of the target the attack is able to hit - if a space frigate is twenty-four inches in length, but only four of those inches are visible and in range, then the bonus is only +2. Measuring the Size of objects is described in greater detail in 7.1: Structure, but it works like you'd expect - players measure the main body of an object along its greatest dimension, in inches, and that's good enough for most purposes. A standard minifig's Size is one inch. When special precision is required, an attacker can focus on smaller targets. For a target equivalent to a 2x4-stud brick, the attacker fires as normal. If the target size is closer to 2x2 studs, he takes a -1 penalty to his Action Roll. If the target is the size of a single 1x1 stud, he takes a -2 penalty. In the case of minifig targets, this process is streamlined. 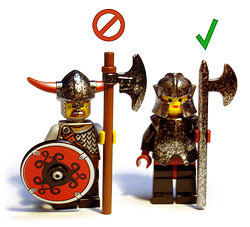 Rather than trying to estimate how many studs' worth of any given minifig is visible, minifigs are divided into three main sections: the head (including helmet, hat, or hair), the torso (including arms, backpacks, and armor, but not carried equipment), and the legs. If the attacker can see any part of one of these sections, however small, then the section is considered visible. If all three sections are visible, the minifig targeted as normal. If the attacker can see two out of the three sections, the minifig is targeted at -1. If only one minifig section is visible, the minifig is targeted at -2. Action Modifiers for target size and visibility also modify the effectiveness of Explosions and other area-based effects. Only the sections of the target within the area of effect are considered. 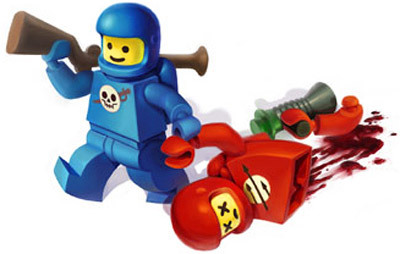 Even if a minifig is fully visible from an Explosion's point of detonation, if his head and body are outside the two inch radius then the Explosion affects his pants only, doing -2 Damage. Natalya's Assyrian forces rely on disciplined Combined Fire to take down heavy targets. from "Zombie (Zulu) Dawn Turn 3"
Although the Assyrians are out of formation, it's worth risking friendly crossfire from Missed Shots in order to focus damage on one of the Immortals' deadly Maniacs. from "Zombie (Zulu) Dawn Turn 5"
If a minifig lacks the power to take down a target by himself, he can coordinate attacks with friends and allies to deliver a Combined Attack. The Damage from all participants is added together and applied in a single large sum, which is handy for punching through otherwise-impregnable Armor levels or for maximizing the humiliation of weaker targets. If units want to join together in a Combined Attack with the units of another player, they may delay individually to make their attacks on that player's turn instead of their own. They return to acting on their own player's turn again afterwards. Combined Ranged attacks (5.3: Ranged Combat) have the simple effect of combining Damage. Any unit capable of making a Ranged attack on the target may join in; he does not need to communicate with the other attackers or to be able to fire at the same part of the target as them. Combined Close Combat maneuvers (5.2: Close Combat) combine their Damage and effects, and also make it more difficult for victims to fight back effectively. Not only will the targets' Counters be quickly used up against multiple attackers, they also take a -1 penalty to all Action Rolls if they (and their allies, if any) have fewer fighters in a single Close Combat engagement than their opponents. The Action Roll penalty for being outnumbered applies even if the opponents are on different teams. If there are several mutually opposing forces in the same Close Combat group, they may find themselves in a situation where each of them is in the minority individually. As a rule, no more than three Close Combat opponents can gang up on a single minifig at any one time, or they'll end up jostling and lopping each others' arms off by mistake. Larger targets are subject to no such hard limitations, although other limits may be dictated according to common sense. In a combined Charge attack (5.4: Charge! ), the attackers combine their Damage and, if they're all striking from the same direction, they can combine their Knockback roll as well. The target must be big enough for all the attackers to Charge into at the same time; otherwise, they're prone to disrupt their own Charge by all crashing into each other. When combining attacks of different types, keep in mind that Close Combat fighters are likely to be directly in the line of fire of any of the Ranged attackers' Missed Shots (5.3: Ranged Combat) or the Charging attackers' Charges if any of them blow their Action Rolls. This Adamarian sentry overlooks the Alkborough colony from the height of his guard tower. From "Battle of Alkborough Village"
Although this assassin can't actually see his target, the shadow on the rice-paper wall gives him a pretty good idea of where to strike. The remaining Action Modifiers don't fit into the standard categories. Attackers frustrated by targets that are slightly Out of Range can fire their weapons anyway, but their attacks' accuracy and effectiveness drop off quickly with distance. For every inch past a Ranged attack's Range, the attack suffers a -1 penalty to to its Action and Damage Rolls. In later chapters, some Damage types have secondary effects based on the dice in the Damage Roll. For secondary effects based on individual die results, like Fire (8.3: Automatic Weapons) and Grinding Damage (7.2: Taking Damage), the number on each die is treated as one lower for every inch the target is Out of Range. The Damage penalty for attacking Out of Range is ignored for Explosive weapons, which do the same Explosive Damage regardless (3.2: Ranged Weapons), making this a handy option for thrown grenades. Units firing at a target they can't see are Firing Blind, and receive a -5 Action penalty in addition to any other Action Modifiers at play. The target may be hidden or invisible, the attacker may have been blinded or blindfolded, or he may be extra cocky and firing backwards over his shoulder with his eyes closed. While he is unable to see the target, the attacker must still somehow have a very close idea of where the target is (within one inch) to attempt the attack. The target may have chosen a very small and obvious hiding place (he's hiding inside a pup tent) or he may have made enough noise to give away his location (his cell phone went off). A unit with a melee weapon can use it to try to whack any object within reach. Inanimate targets (trees, buildings, helicopters) are not notably responsive to such aggression. they take whatever damage is applied and, assuming they survive, stoically continue on with whatever they were doing. More reactive targets (minifigs, animals, robots) are less likely to take that kind of thing lying down. Whenever one melee unit attacks another with hand-to-hand weapons, the two of them leave the regular turn cycle of Movement and Action and enter into the more refined state known as Close Combat. Close Combat is usually initiated by one minifig running up to hit another with whatever he's holding in his hands. It can also occur when he carelessly wanders within range of an enemy's melee weapon, and that enemy makes a preemptive Response attack. Close Combat is often one-on-one, but can also involve larger groups ganging up on lone victims or attacking each another in grand melees. Any minifig or group who are outnumbered by their opponents in Close Combat fight with a -1 penalty to their Action Rolls. Remember that no matter how large the groups are, no individual minifig can be the target of more than three Close Combat attackers in a single player's turn. 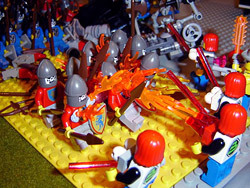 A minifig who is engaged in Close Combat cannot make Response Actions to events outside of Close Combat. Even Space Ninjas lack the skill to coordinate this many swords at once. The Space Pirate is momentarily safe as his overeager foes become entangled in one anothers' blades. While in Close Combat, minifigs are locked in an intense struggle, attacking on their own turns and countering attacks on their enemies' turns with as many weapons as they have available in hand, until one side is defeated or makes a shameful retreat. 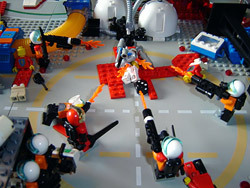 On each player's turn, every minifig in Close Combat can use each of his hands once, with or without held objects. Normal minifigs are limited to a maximum of two maneuvers per turn because they only have two hands. An Angry Inch is easy to construct - two bricks and two plates stacked together make a very accurate inch. This warrior lunges forward one Angry Inch to Strike an enemy just out of reach. When the enemy gets too close, she jumps back one Angry Inch to give herself room to swing her blade. Minifigs in Close Combat don't take Movement in the normal fashion. Instead, prior to each maneuver, they can lunge up to one inch to better position themselves. This fancy footwork is known as the Angry Inch, and it's not counted against the minifig's regular Move inches. Minifigs can take advantage of this free inch as many times as they make Close Combat maneuvers against an opponent. A minifig cannot deliberately use an Angry Inch to move to a location from which he would be unable to complete his maneuver. A minifig who's Disrupted from a previous turn can use an Angry Inch to recover and immediately initiate a Close Combat maneuver, but only on his own turn. On a minifig's own turn, he is the active combatant who drives the course of Close Combat. He can use an Action to Engage his opponents with a Strike, a Grab, or a Shove. If he's feeling cowardly, has a more important Action to focus on elsewhere, or just forgets to Engage any of his opponents, he can Disengage, either withdrawing from Close Combat to take Action elsewhere, or ignoring the opponents trying to murder him, although this often doesn't end well. A Striking minifig makes a Close Combat attack with a weapon he has ready in hand. Minifigs without a weapon will be at a serious disadvantage in Close Combat. Fortunately, many types of Random Objects can be used as Close Combat weapons in a pinch (3.4: Desperate Measures). Before the Striking minifig makes his Action Roll, a target with a Shield can declare their intention to Parry. The attack then proceeds as normal. The attacking minifig makes an Action Roll against the Use rating of his weapon, and if it hits, he makes the weapon's Damage Roll to see how much Damage he delivers. If he has a second weapon ready in hand, he can use it to make a second Strike against the same target. 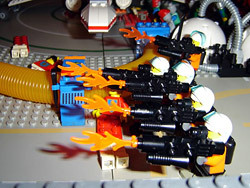 If a minifig or group of minifigs make multiple Close Combat attacks on a target in the same turn, all of the Damage is cumulative. Remember that a target minifig can only be attacked by a maximum of three Close Combat attackers during any single player's turn. An active minifig with a free hand (or other gripping appendage) can use it to Grab an opponent within reach. A Grab succeeds as an Automatic Hit unless the target Parries or manages to Bail in time to avoid it. A Grab does no damage, but once one minifig Grabs another, any Close Combat attacks on either of them (including Counterstrikes and Strikes from minifigs not involved in the Grab) are Automatic Hits. Naturally, the Grabbed minifig will be able to Strike with an Automatic Hit on his own turn, making Grabs risky against armed opponents. While in a Grab, the minifig doing the Grabbing must keep at least one hand on the minifig being Grabbed. Neither minifig can move, Bail, Disengage, or use Angry Inches to reposition themselves until the Grab is released. The Grabbing minifig may release the Grab at any time, including right after making his own Strike on a subsquent turn. A Grabbed minifig can break the Grab with a successful Shove or by killing the Grabbing minifig. If the active minifig has no Close Combat weapons to Strike with, if he has a Two-Handed Weapon and his target is too close to attack with it, or if his adversary is standing in front of a bottomless pit after foolishly insulting Sparta, the minifig can Shove his opponent. He must position himself within arm's reach of his opponent to make a Shove attempt. A minifig can use a Shield to Shove one-handed; otherwise, a Shove always takes both hands, regardless of what he's holding in them. If a Shove isn't Parried or dodged by Bailing, it's an Automatic Hit. 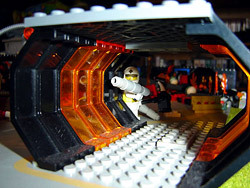 The target takes two inches of KnockBack (3.2: Ranged Weapons), getting pushed two inches directly away from the Shoving minifig and Disrupted. An active minifig who'd like to focus on something other than his Close Combat opponents can attempt to Disengage. Before taking advantage of his new freedom from Close Combat obligations, up to three of his opponents can immediately take an Angry Inch and make one Counterstrike if they have a weapon they haven't used yet in the turn. If the Disengaging minifig survives, his Disengagement is successful. 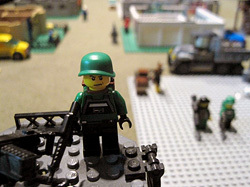 A Counterstrike works the same way as a Strike, except that a Counterstriking minifig can only use one weapon, and they can make the Counterstrike even if they've already spent their Action. Their Action is spent afterwards either way. If the Disengaging minifig is being Grabbed, he can't Move as part of his Disengagement; he remains Grabbed in place while focused on whatever else he's doing. Otherwise, he can take an Angry Inch to aid his escape and then move freely. If his Movement takes him outside the reach of his opponent's Close Combat weapons, then he's no longer in Close Combat with them. Otherwise, he remains in Close Combat in his new position. If the minifig tries to counter his opponents' Counterstrikes as he's Disengaging, either Parrying or Bailing, then his Action is spent. Otherwise, he's free to spend it on whatever new Action he likes. Counters are a special kind of action which blurs a minifig's usual limit of spending one Action per turn. A minifig in Close Combat can use his full allotment of Counters whether he's spent his Action earlier or not. Either way, the Action is spent afterwards. A minifig has his full set of Counters available (that is to say, one Counter for each weapon or empty hand) on every player's turn. Example: Two Cowboy minifigs, Hank and Butch, are in a surprise barroom brawl after being attacked on their own turn by a Response Action from two Outlaw minifigs. Although it's the Cowboy's turn, the Outlaws are temporarily the active combatants, because their Response Actions initiated the Close Combat. Both Cowboys both have their full set of two Counters available. Hank is carrying a garbage can lid Shield and a broken bottle, while Butch is holding two table legs. Hank uses the Shield to Parry one of the attacks, spending his Action. Butch takes the other Outlaw's attack. Next, it's the Outlaws' turn, and they get their own Actions back. One attacks Hank again, while the other is yellow-bellied and tries to Disengage. The Cowboys have their Counters back, because it's a new player's turn. Hank Parries with the Shield again, and both Cowboys make one Counterattack on the fleeing Outlaw. Hank's Action was already spent from the previous turn, and now Butch's Action is spent as well. A minifig Parries by making an Action Roll against the Use rating of the weapon or object he is Parrying with. When Parrying, Ranged weapons are treated as Minifig Tools (Use:3) rather than using their Ranged Attack stats. Bare Hands have Use:0, meaning that Bare-Handed Parries rarely fail except in Critical Failures or when there are significant Action penalties. If a minifig is Parrying against an opponent making an Attack or Shove using a Two-Handed Weapon, he Parries with +1 to his Action Roll due to the weapon's large size. If a Parry fails, then the opponent's maneuver is not deflected. 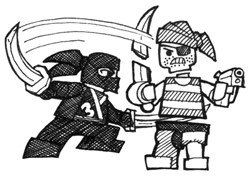 Worse, any time the Parrying Action Roll is a Critical Failure, the Parrying weapon or object (if any) is knocked out of the minifig's hands, directly away from the attacker, for a number of inches equal to the attacker's Action Roll. Close Combat attacks can only be Parried by a Shield. If a minifig successfully Parries an attack or other incoming Damage with a Shield, then he has Deflection against the Damage, removing one of each type of Damage dice in the roll (3.3: Bodily Protection). A minifig who rolls Over the Top when Parrying Damage can spend the Benny to take an extra level of Deflection against the incoming Damage. A minifig who's Parrying with Bare Hands is still out of luck, though; bare-handed Parrying is purely Heroic Feat territory (6.3: Heroic Feats). Outside of Close Combat, a Shield can be used to Parry any incoming Damage within the minifig's field of view as if it were a Close Combat attack. A minifig Parrying a Grab or Shove can use any weapon or object already in hand, or he can use his Bare Hands if he's holding nothing in them. A successful Parry cancels the effects of the Grab or Shove. When the consequences of a Grab or Shove would be truly dire, the Parrying minifig may drop objects in hand before making the Action Roll in order to Parry with Bare Hands (Use:0) instead and improve his chances of successful evasion. Guns aren't always held in the hands, as these skeleton knights discover. These ladies keep their weapons close to their chests. Rather than get caught up in the chaos of hand-to-hand combat, minifigs may try using Ranged attacks to strike cleanly from a distance, using dedicated Ranged weapons or by throwing Close Combat weapons in a pinch. Ranged attacks are straightforward affairs. After taking appropriate modifiers into account for visibility and range, the attacking minifig rolls his Action Roll against his weapon's Use rating and applies its Damage Roll on a successful hit. When a Ranged attack misses, the shot is usually considered to have flown off into the sky or harmlessly impacted the ground next to the target. Any player may insist on tracking a Missed Shot more accurately, if they have a good reason to make the effort; for many shots it's not worth slowing down the game. Players might think that the target is big enough that even a bad shot would have hit it, or that an Explosive landed close enough to the target to catch it in the blast radius, or they might be looking greedily towards other potential targets in the field of fire. When a Ranged attack misses, and players decide to track the shot, check to see how many points the Action Roll missed by. (For instance, if the attacker needed a 5 but rolled a 3, then the Action Roll missed by 2.) The Missed Shot lands somewhere within this many inches of the target. If the target of the attack belongs to an opposing player, then that player gets to decide where the shot lands, within that many inches. Otherwise, the attacking player chooses any of their current enemies to pick the spot. They can pick any spot within the Missed Shot range for the shot to strike, no matter how Koincidentally ridiculous or unlikely, provided that it's somewhere the weapon could theoretically have hit in the first place. The weapon's Damage is then dished out as appropriate, including any penalties for going Out of Range. The only restriction to the enemy's choice is that they can't choose a target that's owned by any player other than themselves or the player making the attack. Anyone else's units are off-limits, unless hitting them can't possibly be avoided. Example: When this viking sees his pirate buddy under attack from a ninja ex-girlfriend, he hastens to intervene! The ninja is too far away for him to engage in Close Combat, so he runs forward and hurls his viking axe at her back. 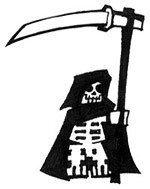 A thrown Hand Weapon has Use:2, Range:3", and Damage:1 Action die. The ninja is just within range, and with the axe's easy Use rating, the viking only needs a 2 or higher to hit. Sadly, he rolls a 1. The viking rolls his Action Die of 1d6 for Damage, minus one for the Out of Range penalty - a 3, not enough to kill the pirate, just enough to give him major lacerations. The pirate and viking laugh together, because pirates enjoy being cut. Thwarted, the ninja ex-girlfriend vanishes into the shadows, where she prepares for a night of composing whiny entries for her emo ninja blog. The third way for minifigs to make attacks is to run flat-out and smash into their target, either with a thrusting weapon or with their own bodies. 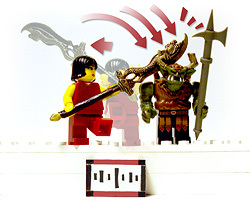 A Charge can be used to add power to a thrusting attack with a Charging Weapon, but occasionally minifigs find themselves just slamming into things, whether on purpose or by accident. Knightly jousting, football tackles, and car crashes are all examples of Charge attacks. Charge attacks can be combined with a Sprint into a single Action (4.1: Movement), allowing minifigs to both cover ground and cause trouble in the same turn. For a Charge to be of any use, a minifig must build Momentum. He does so by running, Sprinting, flying, or falling out of the sky straight at his target from at least four inches away. As in real life, anything shorter than four inches grants no advantages and can be safely ignored. Momentum is counted with a special type of Benny called a MOM. Because of his small size, a minifig can never have more than one MOM at a time. A minifig gains a MOM when he's run for four inches in a straight line, and it lasts for as long as he continues traveling in that line. The moment he turns to the right or left from his straight-line path (jumping over obstacles or running down slopes is allowed), does anything that would prevent running at full speed (opening a door or running up stairs, for instance), or ends a turn without using up all of his Move inches, his MOM abandons him and and has to start over. Fortunately, he can get a new MOM as soon as he runs another four inches. A MOM can be added to any roll or stat that would logically (by the players' definition of logic) benefit from the Momentum of a speeding minifig. A minifig might roll his MOM to add +1d6" to the height of a pole vault, the length of a long jump, or the Range of a thrown spear. He might also use it to cause 1d6" of KnockBack in a Collision or a Charging Shove. The most common use for a MOM is to add an extra Action Die of Damage to a Charging attack with an appropriate Charging Weapon. A MOM only works in a direction directly in the path of the Charge; it can't be spent at an angle off to one side or to the rear. As soon as the minifig rolls his MOM, the MOM is spent, and he must run another four inches to get a new one. Unless he's stopped by whatever he ran into, he must continue running in a straight line to the limit of his Move inches for the turn, even if this forces him to run over a cliff or into a wall of spears. This can be especially inconvenient when Bonus Dice on a critical Sprint roll add more inches of Move than he was prepared for. Poor Olaf's axe isn't pointy enough to Charge with like Betty's. But players might let him Charge with his horns if they're feeling generous. 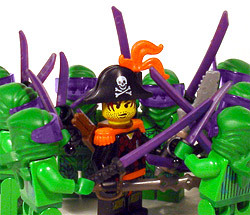 Ramming enemies head-on is a time-honored Charging technique, but a statistically significant number of minifigs prefer to lead with a weapon rather than their own bodies. Not all Close Combat weapons are appropriate for a Charging attack. A Charging Weapon must be a Two-Handed Weapon or a Heavy Weapon swung or thrust with both hands (3.1: Close Combat Weapons). For minifigs Charging on foot, the weapon must be designed for spear-like thrusts (lances, battering rams, rifle-mounted bayonets). For minifigs flying or falling out of the sky, any type of Heavy or Two-Handed Weapon can be used in a mighty downward strike. Players may come up with more exotic examples on a special-case basis. A Charging berserker might use a horned helmet or a spiked shield, for instance, if all players agree to allow it. A Charging attack is treated as a special kind of Close Combat attack. Due to the rush of the Charge, the attacker and defender are each limited to a single Strike and Counter. They may not use Angry Inches. If a Charging attack successfully hits its target, the attacker can spend his MOM to add one Action die to the Damage of the attack. If the attack misses, the attacker keeps his MOM and must either Collide with the target (if the target is directly in his path) or continue running in a straight line to the limit of his Move inches. Charging attacks may only be Parried with a Shield (5.2: Close Combat). When Parrying isn't possible, Bailing is often the best option for Countering a Charging maneuver. MOMs come and go, but a minifig's POP is always with him. Physical Opposition works like Armor - it can be overcome, but not used up. No matter how many MOMs a minifig is hit by in a turn, whether simultaneously or one after the other, he resists each new MOM or group of MOMs with exactly one POP. When a minifig with Momentum crashes into another minifig, a Collision occurs. A Collision occurs as part of normal Movement and does not cost an Action. Even the most heavily-armored minifig is too soft and squishy to cause any damage in a crash, but a Charging minifig has the chance to send targets flying if his Momentum is enough to overcome their Physical Opposition. In the right situations, this can be more entertaining than whatever Damage might have been dealt out, knocking minifigs out of formation, off the sides of of bridges or parapets, and into unfavorable tactical positions like minefields or active volcanoes. A minifig in a Collision spends his MOM to cause 1d6" of KnockBack, sending a target flying directly away from the point of Collision like the KnockBack from an Explosion (3.2: Ranged Weapons). 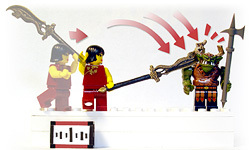 A target minifig struck by a Collision automatically has one die of Physical Opposition (one POP) to resist it, rolling 1d6 and canceling that many inches of KnockBack. If the POP roll reduces the inches to zero or less, then the KnockBack is successfully resisted. The Charging minifig is brought to a dead stop, and the two minifigs are now locked in Close Combat. If there are inches of KnockBack left remaining, then the target minifig is Knocked Back that many inches and Disrupted (4.1: Movement). The Charging minifig must continue running forward to the limit of its Move inches for the turn. If two minifigs cause a Collision by Charging directly at each other, they each inflict KnockBack on each other at the same time. 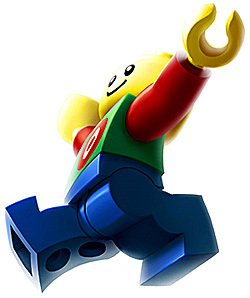 If a Knocked Back minifig is prevented from flying the full distance by slamming into a larger obstacle, he receives one point of Smash damage for every inch of KnockBack prevented, cumulative with any other Damage received from the Charge.